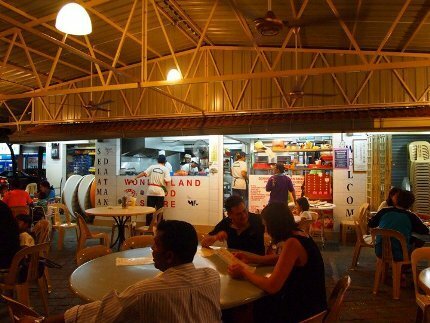 This is a small budget restaurant located in Kuah Town but having fairly large open seating area. Although part of the seating area has roof cover, it gets extended to full open air with more diners coming in. You can see the small yet open kitchen from the seating area. And the food, especially the seafood is fresh and good, and what's important is that the price is very reasonable. In fact they have large, medium and small portions in the menu for most items, so you can choose the quantity according to your appetite. This I think is a big plus for this restaurant. Seafood is the specialty here and you get good choices. However they also serve chicken and vegetables. But beef and pork are not available. You can start with a soup like sea weed soup. In fish you have a choice of snapper, groupa, stingray, seabass and fish fillet. You can ask for fried, grilled or even steamed preparations and they will make it accordingly. The fish dishes come with a choice of sauce like Teoh Chew style, Tom Yam style, sweet & sour, lime & garlic, ginger & soy Sauce, oyster sauce and even local fusion Nyonya style. Tiger Prawns and Lobsters are two other favorites here, and you get a wide range of preparations including dry chili prawns, grilled prawns, Tom Yam style, sambal, sweet & sour and more. Mantis, clams, oysters, crabs and squids are also offered with similar choices of sauce & preparations. In crabs you get varieties like flower crabs, mud crabs and soft shell crabs. If you are a chicken lover, then try out the ginger & spring onion chicken. The menu also has several other preparations of chicken with choices of different types of sauce like in the fish. In vegetables, some of the popular items here includes mixed vegetables, fried Kangkong, Baby Kailan, Bean Sprout etc. You can also ask for green vegetables or salad. They also serve eggs. In staple food you can order for a plate of steamed or fried rice, or even seafood rice. While canned beer (Carlsberg, Tiger, Heineken, Guinness) is the only alcoholic drink served here, you do get a good choice of fresh juices including fresh coconut water, tea, coffee, soda etc. There is parking in front of the restaurant. Reservation is not required. They also offer takeouts. Service is very friendly and the waiters will do their best to explain the menu to you. Over all, very good value for money. A family of four can have a good meal for RM120 including beer. Wonderland is located right at the fringes of Bella Vista Resort & Spa. In fact you can see the mammoth building of the hotel on one side while dining.